Charles R. Hale and Niamh Hyland, co-founders of Artists Without Walls. The chatter isn’t quiet but it isn’t loud; it has a feel-good quality to it. It feels like home. Even for those stepping into the theater for the first time, there are no strangers here. There are no hurdles to conversation, whether in getting a glass of wine or a bottle of water or just joining on any number of loose groups of people talking. Many times the artists are among them. It is the last Tuesday of the month. And at the Cell Theatre in Chelsea it is the night for the Artists Without Walls Showcase. It is a showcase of incredible people and amazing talent. Niamh Hyland is a wunderkind with sparkling eyes and a warm heart who could have been an attorney, a business executive, a show host, a Ted Talk vet, or a singer with a voice running an incredible spectrum. Actually she already is all of that. And despite all she is and has accomplished, she still has her dreams; and she works hard to help others achieve their dreams. Niamh is a young woman with an old soul, because seemingly only that could explain her insight and wisdom. Charles R. Hale, a man of culture and taste who puts on no airs while tracing his roots to the tenements of Lower Manhattan. He, too, could have been anything, and he certainly was something of importance, and in the end he chose the arts, creating an organization to elevate and promote artists; and to continue searching his past, unearthing the lessons his forebears learned. The lessons are often still applicable to all of us today. He has shown that even trailblazers are often able to benefit from a path cleared a century or so ago. AWoW is a brainchild from Charles. That may sound like a funny word but is is apt. He is much like a father to the members. He is proud of the successes and worries about their hurdles and, despite having an incredibly busy life, he is tireless in promoting the artists and their events. 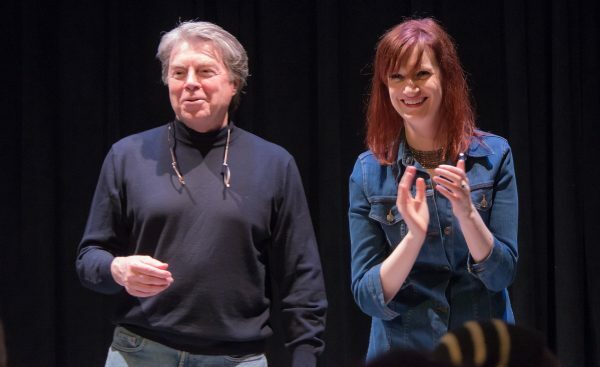 Charles R. Hale and Niamh Hyland are the co-founders of Artists Without Walls. When he’s not somewhere else in the world applying his talent and art to sound production, Emmy Award winner Paul Bevan is comfortably behind the mixing board, adjusting and tweaking the sound to optimize each performance. He makes it look easy but it’s not. 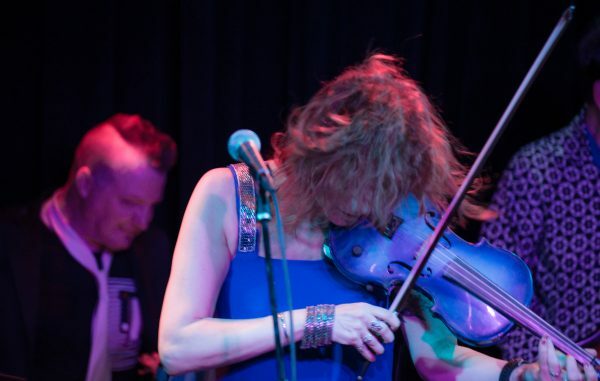 A typical showcase could include everything from an author reading from a newly released book, to actors performing a vignette of an emotional play, to an amazing, emerging rock band. He probably isn’t working with the high level of equipment he is accustomed to but he makes no complaint. Paul’s heart and soul is in the sound and equipment matters less in his hands. 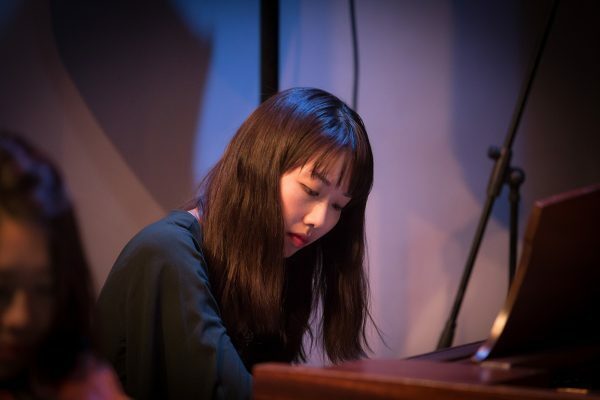 Miho Hazama at the grand piano in the Cell Theatre, while also conducting artists performing a symphony she composed. And then the lights dim and the comfortable, not quiet, but not loud, din abates to silence. The show is about to begin. The Cell Theatre in Chelsea is a special place. In the heart of Manhattan, the center of the known universe, it is the usual home of the monthly Artists Without Walls showcases. Charles and Niamh are on center stage to introduce the first artist. Charles provides some background, someone amazing is about to take the stage. Niamh squints to see past the stage lights into the crowd…and then she smiles. Whether an artist or someone who loves the arts, we would welcome you to join Artists Without Walls. Just click on the “Become a Member” link. We’re looking forward to seeing you at the Cell! 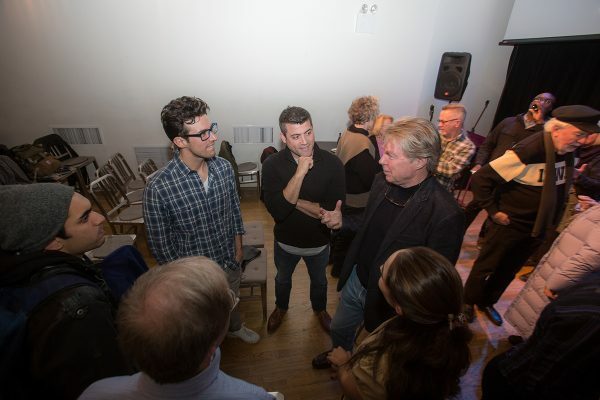 Artists Without Walls co-founder Charles R. Hale chatting with artists and guests at a recent Showcase at the Cell. 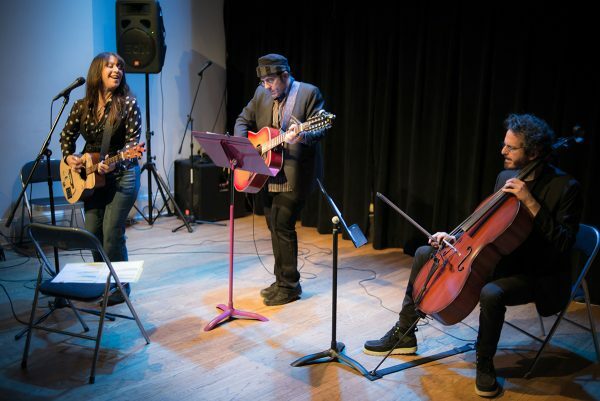 Renowned musician (and photographer) Dina Regine performs with Mark Plati on guitar and Noah Hoffeld on cello at an AWoW Showcase.